HomeSHC NewsSpirit of Caring award. 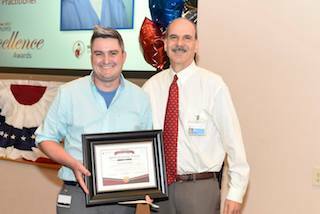 Earlier this week we awarded one of our employees with our Spirit of Caring award. This person is nominated for this award by their colleagues, patients, families or volunteers at the hospital. This award is given every year in recognition of an individual whose efforts, in the course of performing their job consistently exceed expectations. Congratulations to our winner, Jeremy for going above and beyond at the hospital and as camp coordinator!